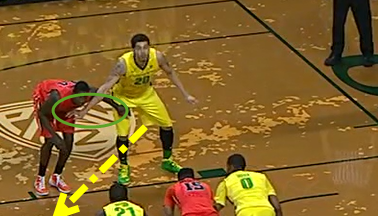 Oregon Basketball Analysis: Free Throw Defense?!! Basketball teams play free throw defense? Yes! 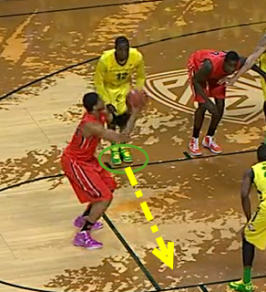 Although very subtly, quality teams such as the Ducks, execute a defensive scheme every time the opponent steps to the line. Free throw defense is important to the Oregon Men’s basketball team because they want to do two things: get out on the break and get buckets. But to initiate their fast break, particularly off a missed free throw, the Ducks must rebound-and-outlet perfectly from beginning to end. All five defensive players have a role, every time, without fail. Via quick communication, the Ducks relay to one-another which respective role they’ll be filling. Somebody must box out the shooter, and typically, this role is assigned to the 2-guard. Offensive rebounds and put-backs off free throws can devastate the defense. In the situation above, guard Jason Calliste calls out to his boys, “I got shooter!” This is to not only to let the other Ducks know who is responsible for the shooter – obviously – but also works as a minor form of distraction. So, as we will see from the GIF at the bottom, Calliste will begin his box-out as soon the ball is released from the shooter’s hands. However, he begins with his feet together as to reduce to minuscule amount of distance between him and his man. When the shot is released, he’ll step across the key in front of the dirty Beaver, all the while keeping his eyes on the ball. 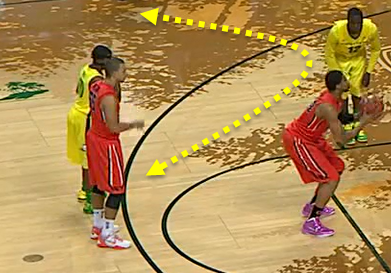 The Duck closest to the 2-guard is usually the biggest man on the court. Since Calliste will be focused on the shooter, seven-foot Waverly Austin (No. 20 above) will be alone in his box-out. Austin’s role then is to find the opposing team’s second-best rebounder and box him out sufficiently, by himself. 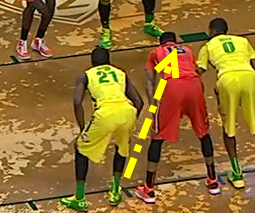 Notice that Austin is already touching his man, as any advantage in a speedy free throw sequence is hugely important. Before the ball is released, he should have his knees bent, hands up, and one, long arm across the opponent’s chest. As soon as the ball is released, Austin will step up the key with his outside foot going toward the parallel elbow. Since he doesn’t get this rebound, Austin’s job then becomes to sprint down the middle lane. Across from the biggest Duck – Waverly Austin, in this instance – will be the opponents’ big man. In this case, we see forward Mike Moser (No. 0, above) ready to box out the Beaver’s best rebounder, Eric Moreland. This is not coincidental; the big man’s role will always be to box out the opponent’s top rebounder. Moser is not alone, though, as Damyean Dotson will help pinch. Because of the pinch, Moser will start with his feet somewhat close, as to limit the total distance between him, Moreland, and Dotson. 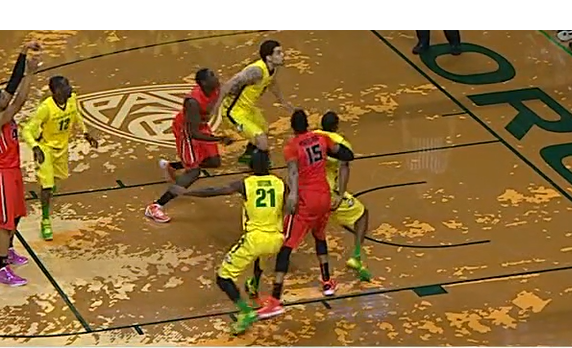 After the release, he will mirror Austin by stepping with his outside foot up the key toward the opposite elbow. On this play, Moser snatches up the rebound and makes the outlet pass to initiate the break. As aforementioned, 3-man Dotson (No. 21, above) needs to help Moser out with Moreland. To do this, he initiates a pinch, where he and the big man essentially pinch the opponent out of the key. Once the ball is released, Dotson will step down the key toward the parallel block. Essentially, his right foot should connect with Moser’s left, as to completely shut down Moreland’s attempt at an evil O-board. Here, Dotson performs the pinch to perfection, and Moser is able to retrieve the rebound. Last, but not least, we have the point guard. His job is simple: get the ball and get it up court. Most commonly, of course, the free throw is made and Johnathan Loyd (No. 10, above) needs to simply receive the ball off an inbound pass. In case of a miss like this, though, he runs in a ‘U’-shape toward his rebounder with hopes to get the rock at the bottom of the U on his way back up the court. He runs this peculiar route so as to not lose any momentum up the floor. 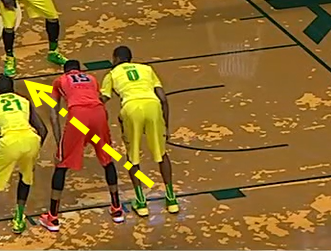 Moser will outlet the ball to Loyd right where he wants it and thus the transition is born. With all the nuances of basketball, some fans forget about the basics, such as what to do on an opponent’s free throw. With a team such as the Ducks, however, we cannot discount any effort they take in moving the ball at lightning speed. Like clockwork, the Ducks will continue to play exceptional free throw defense and consequently get buckets in transition. And, like clockwork, if opponents such as the Beavers, make mistakes such as missing free throws, they will suffer for it. Basketball is, simply, a complicated sport.